It was a busy summer for real estate which is very typical for our area. Nationally, existing home sales dipped slightly in August, but in our area numbers remained strong throughout the third quarter. Often we see our prices dip slightly in the late fall, when we are nearing the end of our busiest season and winter is around the corner. Sellers motivation has a tendency to increase when snow is in the forecast. Looking at the closed sales for the McCall area during the third quarter based on our local MLS, we see that 101 residential properties sold with average prices around $343,322, which is up from the second quarter of this year and significantly up from the third quarter in 2014. In the Donnelly area, 17 residential properties sold during the third quarter with an average sales price around $217,512, this is up from the second quarter but down from the third quarter of last year. Cascade area residential sales were at 20 closings this quarter with an average sales price of $154,065 which is also up from the second quarter of this year and the third quarter of last year. New Meadows area had 11 closings this past quarter with an average sales price of $239,364. Their average numbers are also up from the second quarter of 2015 as well as year over year for third quarter of 2014. Once again strong numbers in real estate for closings around McCall and surrounding areas for the third quarter in 2014. It will be interesting to keep watch over Donnelly and Tamarack’s real estate over the next several months with the announcement of the 7 days per week operation for the ski resort for the 2014-2015 season. The excitement of the new ownership and resurgence of money and attention into the resort will be a huge boost for employment, owners living at Tamarack and the overall general real estate in that area. 76 closed sales with over $26,058,603 in total dollar volume. The average sales price was $288,950 and median sales price of $277,000. Average days on market were 144 days. 23 closed sales with over $6,732,800 in total dollar volume. The average sales price was $292,730 and median sales price of $260,000. Average days on market were 169 days. 15 closed sales with over $2,787,750 in total dollar volume. The average sales price was $185,450 and median sales price of $192,500. Average days on market were 271. 21 closed sales with over $3,080,900 in total dollar volume. The average sales price was $146,710 and median sales price of $135,000. Average days on market were 208. Please contact me for more information on these or other properties. Data was gathered from our Local MLS. We were excited to see McCall recently featured in the September/October 2014, “Where to Retire Magazine”. Stated as one of the undiscovered havens for retired couples, the article shares some stories from recent retirees to McCall along with some useful and interesting facts about our area. If I wasn’t still working, I would enjoy retiring in this beautiful Gem State town of McCall. Please contact me if you would like to have a copy of this article sent to you. McCall and surrounding area’s real estate continues to remain strong and improving over last year’s numbers. Our year to date for 2013 for McCall’s residential closed sales based on information from our local MLS states there have been 218 closings with an average sales price of $306,492 and an average square price per foot at $162.51. This is almost a 15% increase over last year’s average at this same time. Inventory is at an all time low as well, with less than one year of supply of McCall’s homes. Keep posted for a report on year’s end number in a couple months. September real estate closings for the McCall area were down from August, with 35 closed transactions which were represented by 1 commercial property, 12 vacant land sales, and 22 residential. The overall dollar volume was $7,290,000 with an average sales price on the homes to be around $289,391 and for the vacant land average sales price to be $62,033. It seems like we are slowly making a swing up in average prices and quantities sold. 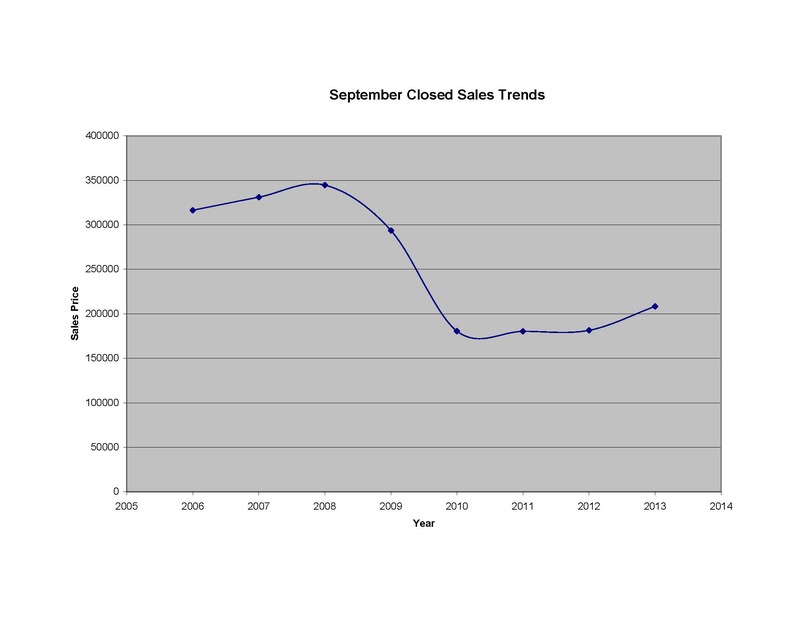 The graph below shows how the trend of average sales prices for the month of September in year over year comparison. Information was gathered through our local MLS; please give me a call or email if you have any questions or would like to learn more about real estate in our area. 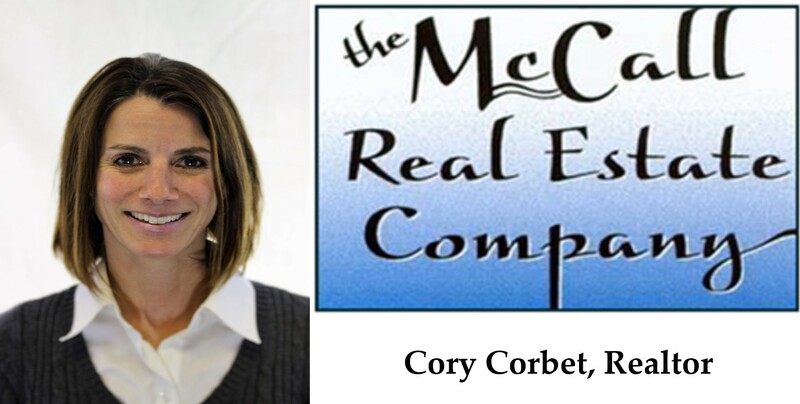 “We totally lucked out when we chose Cory Corbet to be our realtor. It took us 2 years to find the right property and Cory was professional, patient, communicative, responsive, and understood every angle throughout the whole process. I would not hesitate for a second to recommend her to anyone thinking of buying or selling a home. She understands every part of the process and I would have complete confidence in her ability to close the deal. We had 1031 exchange along with tricky sellers, so when it finally closed, it was a big sigh of relief for us all. She met me at the house to personally hand over the key, and when I drove up with a truck load of furniture, she even helped me unload the truck! She definitely went above and beyond the call of duty as my realtor. Cory was an awesome agent and I feel like I have also found a new friend. ” Amy, Santa Cruz, California. Thank you, Amy and all those others that have let me be a part of their real estate journey. Just half way into March and it appears that McCall’s real estate market is really picking up compared to past few years. Since March 1, 2013 there have been 21 closed transactions for the McCall area with an average sales price of $127,607 and a total dollar volume around $2,679,750. This time last year in McCall, there had been only 14 closed sales, the average sales price was a bit higher at $141,975 and a total dollar volume at $1,987,651. When you compare this to 2011 it drops significantly. For the first two weeks of March in 2011, there were only 6 closed transactions in McCall with an average sales price of only $96,750 and total dollar volume at $580,500. This is a great start to what appears to be an improving real estate market in the McCall area.